Whitefish is a valuable commercial fish of the salmon family. This small fish (40 -60 cm) inhabits the Northern seas, rivers and lakes. 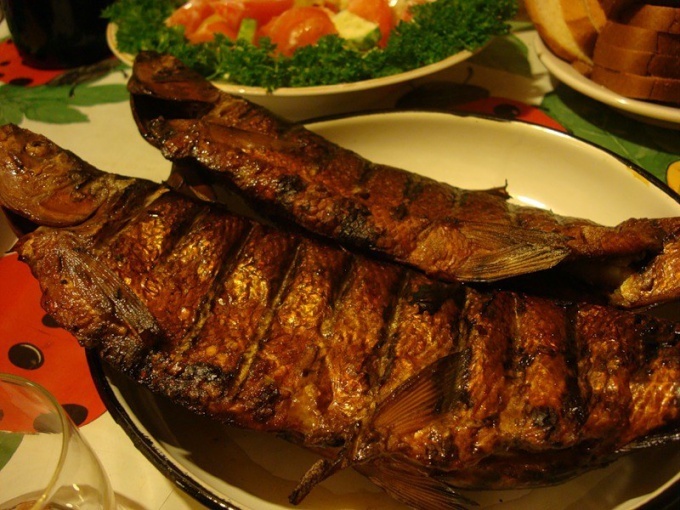 The meat of this fish has a delicate flavor and fat, so it is widely used in fillings for pies. No less tasty fried, boiled and smoked whitefish. 1 big bunch of dill. Clean the fish, wash, dry wipes, heat the pan with vegetable oil and sear the fish until a crust on both sides. Clean the mushrooms, rinse and cut into thin slices (dried mushrooms, 50 g, pre-soak for two hours). Peel the potatoes, wash, cut into slices, green onions finely chop. Connect the mushrooms and the vegetables, season with salt and simmer until soft, at the end of the stewing, pour in the vinegar. Melt in a dry pan until the sugar becomes brown, pour the burnt sugar into the mix of vegetables with mushrooms, stir. Place the fish on a dish, put the sauce, sprinkle with herbs. Gut the whitefish, the scales are not to scrape, wash of mucus, cut off the head. Wipe the fish dry with a napkin, divide it in half along the abdominal incision, remove the bone, but the skin connecting the two halves, do not break. In a wide dish, sprinkle coarse salt and place whitefish, skin side down. Sprinkle the fish on top of salt, sugar, crushed white pepper and chopped fresh dill. Have a second fish in the same way as the first. Put it on top of the spices, skin side up, meat side down. On top sprinkle the carcass with coarse salt and dill, put the fish on top of a light load, so he pulled the carcass towards each other, but not squeezed juice, and leave for a few hours. Finely slice onions, saute in oil. Sauerkraut soak, cut the apples, remove the seeds and chop, mix cabbage with apples. Put in a saucepan sequentially: the number of cabbage with apples, some fried fish, some onions passerovannogo. On top sprinkle with herbs, pepper, put a Bay leaf. Cover and braise until tender, garnish the finished dish of pickles, marinated mushrooms, olives. If you are in doubt about how to cook whitefish, try it baked. This freshwater fish will love you and will remember especially if generous use of spices, and when cooked combine with various vegetables and herbs. dry red wine - 100 gr. vegetable oil - 1 tbsp. Bake whitefish with onion and dill. For this, clean off the scales of a fish weighing about 1 kg, disembowel, rinse and liberally RUB with salt. Cut into rings 2 large onions bulbs and lay them on the bottom of a deep baking dish. Then sprinkle 2 tablespoons of chopped dill. Lay on top of the SIGwithout cutting into pieces. For convenience, you can roll the fish ring. Cover the form with foil and place in preheated 160оС the oven for 1 hour. The finished dish serve hot with boiled potatoes or rice. For cooking whitefish with zucchini and mushrooms cut into 500 grams of fish fillet into large chunks, sprinkle with salt, pepper and thyme on both sides. 200 grams of fresh mushrooms and the same number of zucchini cut into small slices. In a hot frying pan with 2 tablespoons vegetable oil place the zucchini and sauté until Golden brown. In a separate pan in the same oil fry the mushrooms. Form for baking grease with butter and sprinkle with 50 grams of bread crumbs mixed with 1 tablespoon parsley. On the bottom of the form put half of the prepared zucchini and mushrooms and place on top of filet whitefish. Cover the fish with the remaining mushrooms and zucchini, then pour 100 grams of dry red wine. Sprinkle the dish with chopped parsley, lay on top thin slices of butter and place in oven for 30 minutes. 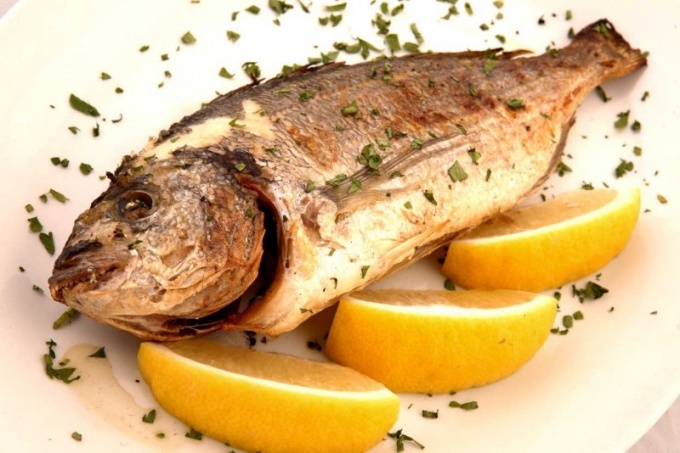 Bake at 180 ° C.
Bake whitefish with lemon. This clean one fish, disembowel and cut along the abdomen from head to tail. The inner part is salt and pepper. One tomato and half a lemon cut into thin circles, then put them inside the fish. Grease 1 tablespoon French mustard, sprinkle 2 tablespoons of chopped dill. Put whitefish on the foil, lubricated with oil, and preheat the oven to 220оС. Fish wrap and place on a baking sheet. Bake for 25 minutes, then the foil to expand and podrumyanivaya dish for another 10 minutes.